Eve Online is a ten years old game. Moreover, it’s a mmo. No matter how you look at it, in a world where the last year smart phone “is” obsolete today, CCP‘s game longevity is an achievement. There are many reasons for it. One of them, in my opinion, is the Eve Economic System. At the heart of it, lies the “unrestricted” player interaction driven by (needs and) desires. You can find here a good summary of the Eve interactions. If you’re a new player, you probably have seen it before since the old players like to show it to newbies. Most of the times their motivation of linking it is unclear, as it seems to oscillate between “go away, stop asking questions” and “look, Eve is that great”. I’m not sure what is the effect of seeing it on people who didn’t try out Eve yet. I think it is safe to assume that, to an outsider, it leaves the impression of Eve being excessively complicated. Well, let’s try to make things look a little better. In this post, my attention is not on the “why” – people feelings, but rather on the “how“-people actions. We can put the Eve Economy in a diagram (see the image below) that captures the essence of this part: the ISK (in-game currency) flow and the items flow. Every player can choose his path in Eve but more importantly, from an economic perspective, every player can choose to be part of the ISK creation process. All the ISK in Eve exists due to some of the actions that a player made somewhere in-game, both in time and place. All these actions are ISK faucets (i.e. npc bounties, mission rewards, insurance, npc buy orders). The ISK sinks are the player actions resulting in the destruction of ISK (i.e. taxes, fees, insurance, npc sell orders, quitting players). The ones that are left are activities that either create items, either have the role of transferring ISK and/or items between players. There is one exception: explosions. OK, there are two if you add quitting players to the list. ISK – the Eve in-game currency is created out of nothing as a result of player actions in base of the game mechanics that consider those actions to translate into positive contributions to the in-game world. If you haven’t been living in a cave the last few decades you should know the answer to the previous question. If you haven’t been busy posting comments on YouTube, for as long as you can remember, I would like to think you know it. 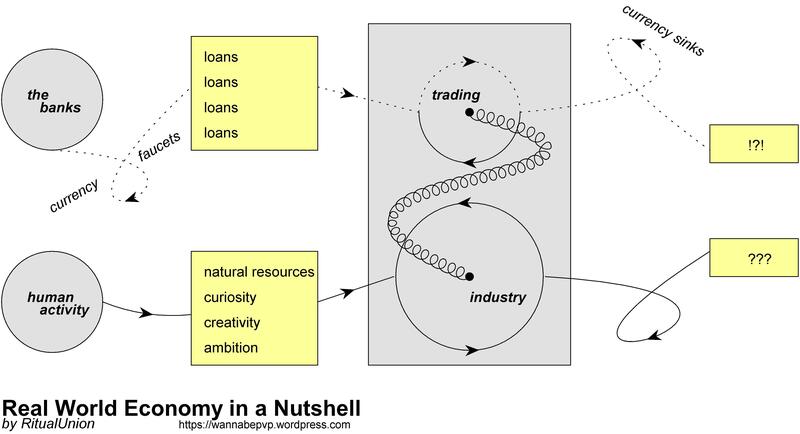 The Real World Economy diagram (see image below) provides the answer. First, ignore the over simplifications. It is clearly not an academic piece of work. Second, take it with an open mind. The real world currency is created out of nothing as debt by the banking system. The interest associated with each loan is not created when the respective loan is issued. You can often see people commenting on the state of the Eve Economy. Every now and then, someone appears to be worried to death on the lack of growth of the in-game economy or something related to it. The fact is that they have little idea of what they are talking. In contrast to the real world economy, where there is a necessity of constant growth to cover the never created currency that is the loan interest or else everything would start collapsing, the Eve Economy model has no need of constant growth to function properly. The reason for this is the different model used to generate the ISK in Eve. First, we create ISK out of nothing but not as debt. Second, since ISK is not debt there is naturally no interest attached to it and, hence, no imperative need of growth. Note to the reader: I’m talking about Eve Economy growth, not about the Eve Online growth as a game. If the capitalism is such a success story, why is Eve lacking one of the core features of it? i.e. Why are no banks in Eve? Ok, let’s raise the stakes: Is the entire (to my present knowledge) mmo game industry dumb (since no mmo use in-game currency as debt)? That’s it for today and, by the way, this post is part of my Eve project: Connections – The ISK Review. Thanks for reading. By Ritual Union in Economy, General on January 15, 2014 . Banks are not restricted to capitalistic governments.